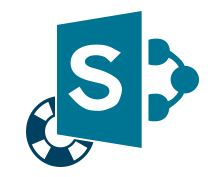 Microsoft launched SharePoint an online well collaborated platform to delegate tasks, update the information on the projects, entity. SharePoint need a back end like SQL Server to preserve its data in the form of documents, tables, etc. Excellent graphical edges and recovery procedure. Prominently scans & repair the SharePoint data. Recover Triggers, Lists, Documents, etc. Export SharePoint documents from database. Easily allow to justify preview of recovered files. 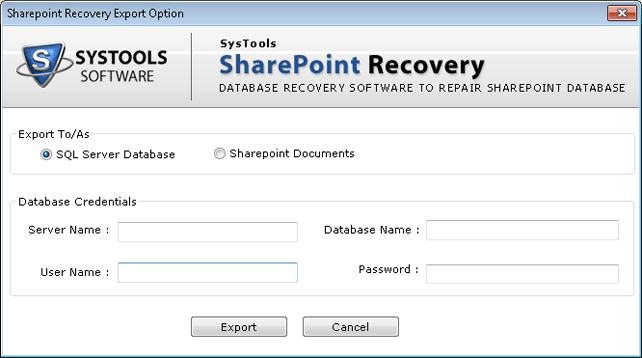 SharePoint database recovery tool allow you to repair corrupt SharePoint database files and recover deleted documents from it. Software can easily recover lists, sites, documents, alerts, workflow state etc from the .mdf file. 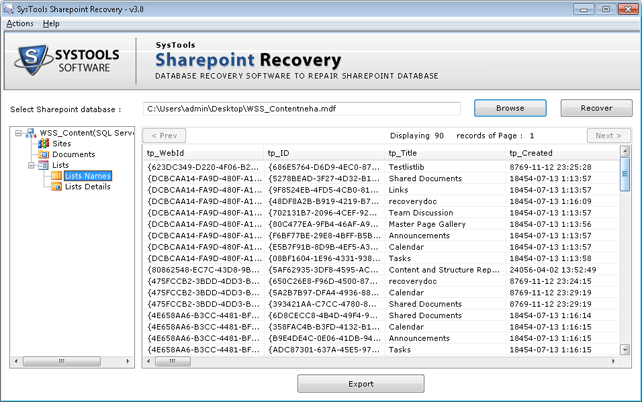 Once the file completely scanned by SharePoint document recovery tool, Software then allows you to preview the recovered detail of sites, documents and lists by clicking on it. Export in SQL Server Database: It allows you to export the database into SQL Server database. Export in SharePoint MDF: It allows you to extract the database in a new .mdf file. 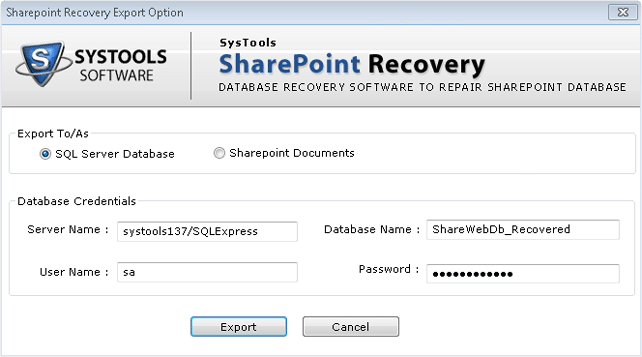 While exporting the recovered components through SharePoint repair tool, the software allow you to export the database items by check and uncheck and save the necessary data. 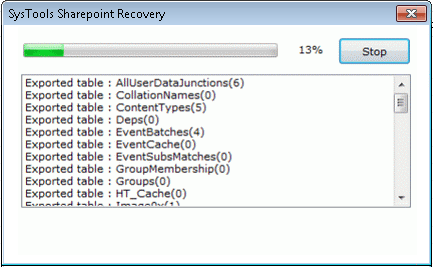 See the path of the File and Click on Recover Button to recover the file . View the recovery process status . Preview all the recovered components. 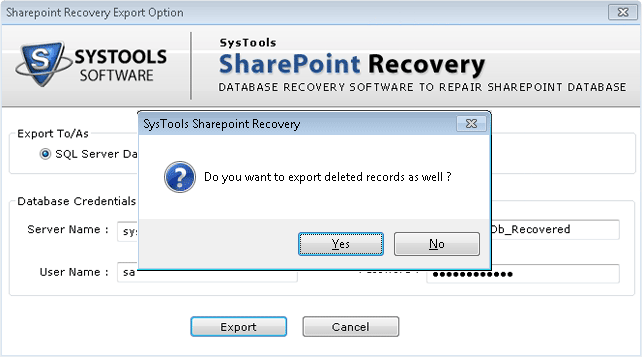 SharePoint Documents:- Export recovered items into Sharepoint. 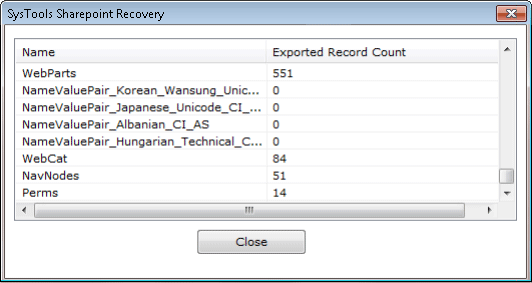 On selecting export, the Export windows appears on the screen asking about recovery of deleted records. If you want, Click on "Yes". Watch out the export status of recovered items. Microsoft SharePoint is nothing but a web based application program that is used by businesses and enterprises for maintaining databases of all the important data items linked to the concerned business or enterprise, as the case may be. Rather say, it is a platform that integrates Intranet portals, document management, file management and content management. At times, it is quite possible that the SharePoint database MDF file pop up with error messages when tried to access the stored contents. This actually results due to the database .mdf file being affected by corruption issues and thereby getting damaged. The cause of corruption can be several such as mishandling handling of the database file, shortcomings in the internal structure of SharePoint itself, power outage, severe corruption in sectors of hard disk drive, etc. Do I Need to provide SQL Server Credentials to export databse in SQL Server? Yes, to export databse in SQL Server, you need to provide Server credentials. Can I use this Software without SharePoint Server Environment? 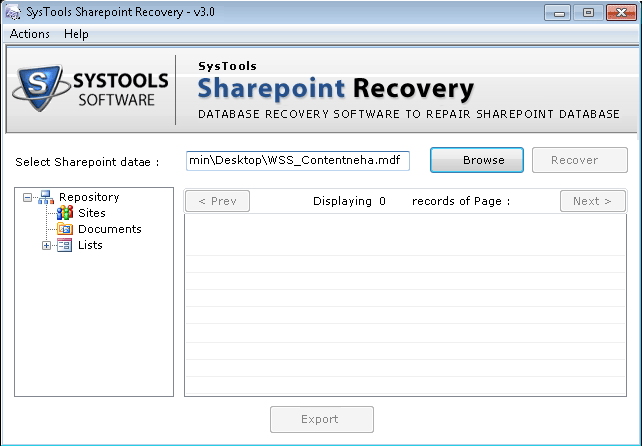 Yes, SharePoint recovery tool can easily recover corrupt SharePoint site from content database without having SharePoint environment on your machine. 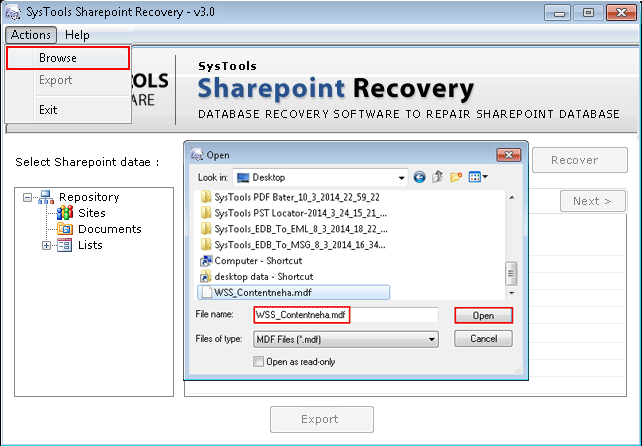 Does the tool Repair Corrupt SharePoint Database Files of 2012 Server? Yes, SharePoint repair tool can support and recover database files of 2012 & below versions. 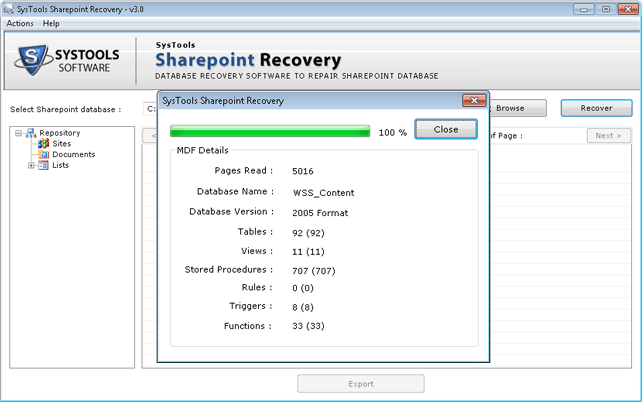 Few of my SharePoint documents were corrupt and I had used SharePoint recovery tool to get back files. The tool provided me all my documents in original form without having SharePoint Server on my machine. Thanks a lot guys! Keep it up for help and support.